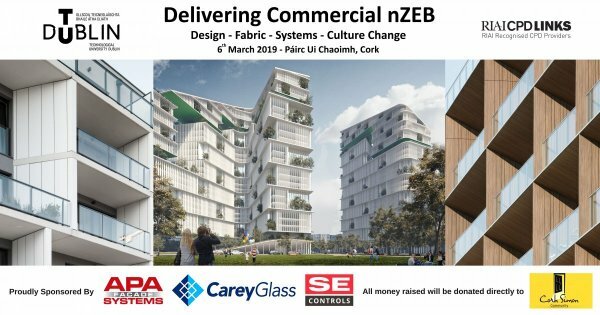 To support compliance with the new nZEB standard (as transposed in Part L of the Irish Building Regulations), Dublin School of Architecture is hosting ‘Delivering Commercial nZEB’ Conference on 6th March 2019. APA Facade Systems, Carey Glass and SE Controls are proud sponsors this TU Dublin event. It’s taking place in Pairc Ui Chaoimh, Co. Cork. The home of Cork GAA. The conference will explore nZEB Standard design through (a) presentations of leading Irish and international building design professionals, (b) a breakout session focused on technical solutions and (c) an alternate round table session where managers can explore ways to re-orient their teams to nZEB through discussion with peers and international experts. Please visit the Conference website for full information including the programme, speaker profiles and location information. Delivering Commercial nZEB has been accredited by the RIAI for CPD points. Members of the RIAI who attend for the day can claim 8 ‘structured’ CPD points. This event will cost €50 per person with all money raised going directly to the Cork Simon Community to help reduce the number of people sleeping on the streets of Cork City. Delivering Commercial nZEB is an essential event for anyone working in the commercial construction industry.